Will 2016 Be International Business Machines Corporation's Best Year Yet? 2015 was not a great year for Big Blue, but 2016 could be better. 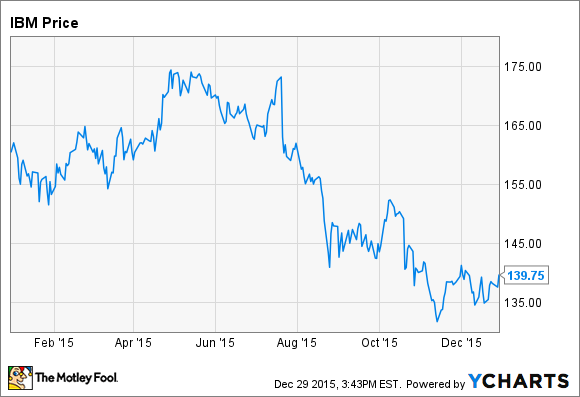 It's no secret that International Business Machines (NYSE:IBM) has had a rough 2015. Revenue has now declined on a year-over-year basis for 14 quarters in a row, with a 14% drop during the third quarter of 2015, and the company's expected earnings for the year are well below its previously abandoned target of $20 per share. The stock has slumped in 2015, following a similar slump in 2014. Despite the pessimism surrounding IBM, the company is making progress on transitioning its business. IBM's strategic imperatives, which include its cloud and analytics businesses, are growing at double-digit rates, and the company has poured resources into long-term growth opportunities like Watson and the Internet of Things. While 2016 is unlikely to be IBM's best year ever, it has a good chance of being better than 2015. IBM has reported a double-digit year-over-year revenue decline in each of the past four quarters, a situation that looks absolutely awful on the surface. However, there are two factors that are negatively affecting IBM's reported revenue that have little to do with the business itself. First, IBM sold off a few businesses in 2014, meaning that a portion of these declines are simply due to the loss of divested revenue. As IBM enters 2016, the company will lap the big decline in exchange rates that occurred during 2014 and the beginning of 2015. Exchange rates could fall further, of course, but if rates remain roughly flat, revenue declines should become much smaller. The company is still facing challenges, but at least the headline numbers should look a lot better in 2016. IBM's strategy boils down to shifting toward high-value products and services, where the company can gain a competitive advantage. IBM has no interest in being the biggest infrastructure-as-a-service provider, for example, and although the company does sell IaaS services through SoftLayer, the focus is on providing industry-leading performance, not maximizing market share. During the third quarter of 2015, strategic imperative revenue grew by 27% year over year on an adjusted basis. Cloud revenue grew by 65%, with total cloud revenue reaching $9.4 billion over the trailing-12-month period. IBM expects strategic imperatives to generate $40 billion of revenue by 2018, up from $25 billion in 2014. This strong growth has yet to offset declines elsewhere, even on an adjusted basis, and it's hard to say whether that will change in 2016. Many of IBM's initiatives, like cognitive computing system Watson, are long-term efforts, and it may take years for them to fully pay off. CEO Ginni Rometty is aiming for Watson to grow into a $10 billion business within 10 years, but because the system needs to be trained on massive amounts of data for each application, progress in turning Watson into a major source of revenue has been slow. IBM has made a big push to use Watson in the healthcare industry, partnering with a variety of healthcare organizations in an effort to improve patient outcomes and provide personalized treatment options. This is exactly the type of initiative that will take years to pay off, if it ever does, but if IBM succeeds, it's not hard to imagine the company generating billions of dollars in revenue from the healthcare industry alone. 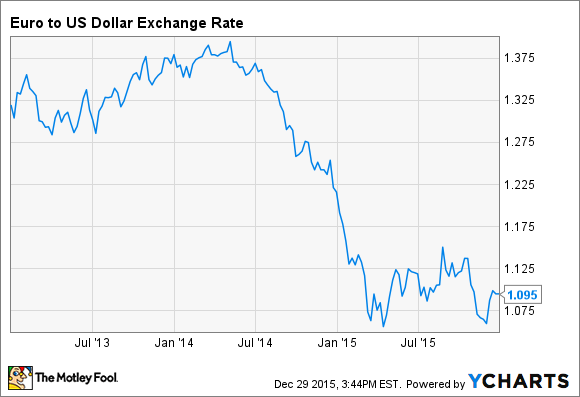 If the U.S. dollar doesn't continue to strengthen in 2016, IBM's revenue declines should shrink dramatically. This has little to do with the business itself, but at least the company's performance would appear to have improved to those who don't look beyond the headlines. Even on an adjusted basis, IBM's revenue is still declining, and I wouldn't expect a huge improvement in 2016. IBM launched a new mainframe in 2015, and without a new launch in 2016, mainframe revenue should start to decline, weighing on IBM's results. However, continued growth of IBM's strategic imperatives should eventually counteract declines elsewhere. Whether this ultimately occurs in 2016 is an open question.